Increase time on the website. 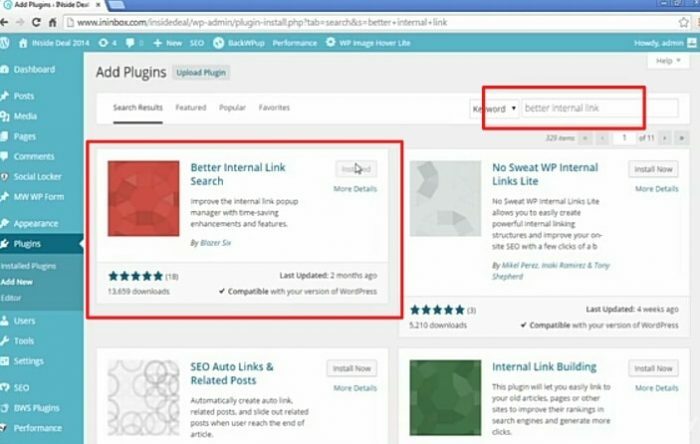 Internal links are really important in improving your results in the search rankings for example if you’re writing an article on your website and creating opposed to the page, whatever and you come to the section of that article. 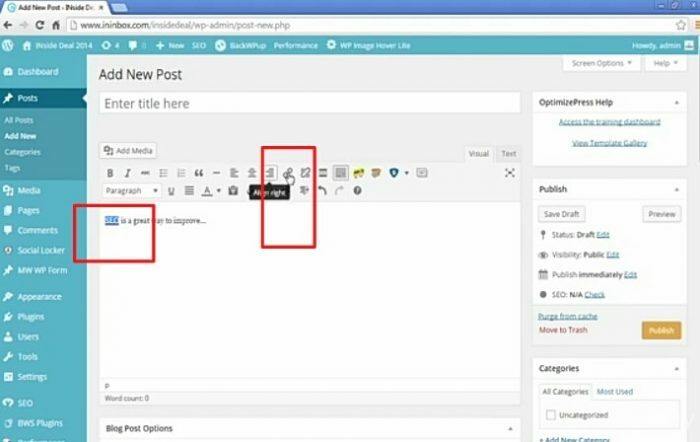 where you mention something that you’ve already written about on another page on your website and you wanna create a link to that page this is really important because well for three reasons. it helps Google find these other pages on your site so in addition to the sitemap that I talk about in this section When you list all of the pages on your site, search spider as they call this, is the program that Google has that goes out and scans. The entire Web to find all the pages that people would like to see, show up in the results they follow. One page to another a lot of times through links on that page. so the more links that you have going to other pages on your website the easier it’s gonna be for Google to find those other pages If there are no links to them sometimes who can’t find them. 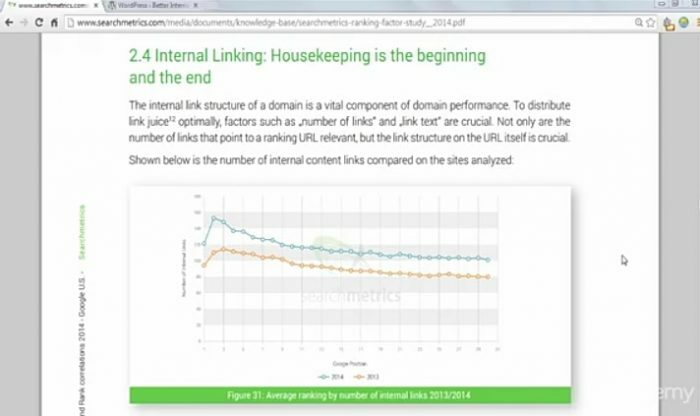 It also helps with keywords so, for example, you’re gonna see in a second I’m gonna show you the results of the search metrics tell you for internal links. If you use good keywords in your links, Google will recognize that this is the page that you think is most important for those keywords. 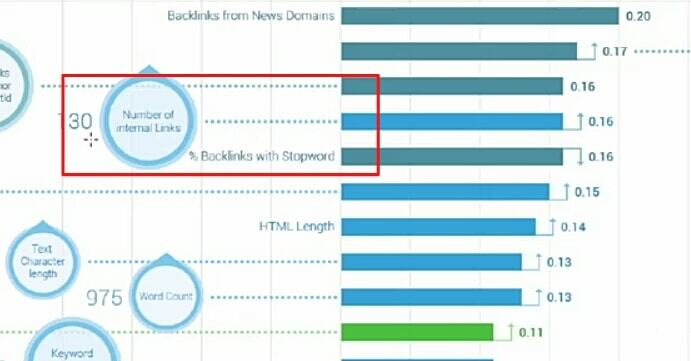 So it’s gonna help with keywords and it’s also gonna help to keep people on your site right because if somebody is reading an article and then they click on Link within your article to open up the page that has to do with whatever keyword they’ve linked to it’s gonna keep people on your site, which, as I mention. and you’ll see here that of the top 30 results for those 10000 keywords they used in the study. Those pages had 100 and 30 other pages on that same website with links to it. I mean they’re saying this is this is the site that I want Google to see is the most important for that keyword and you’ll see down here 62 percent of those links had that keyword within the link itself. 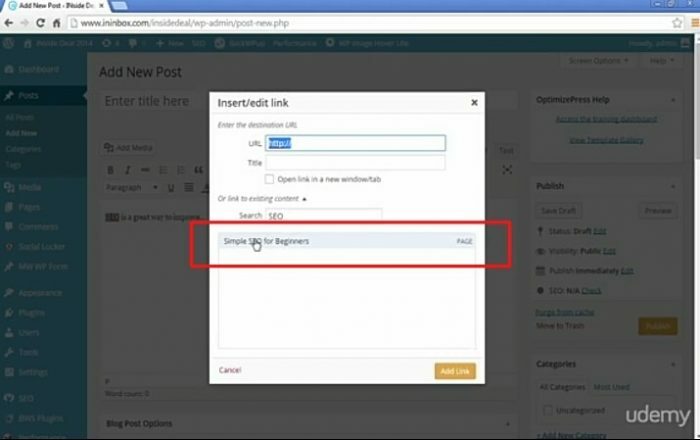 So if you’re linking to an article about SEO, you would want SEO within that link so I’m gonna show you a plugin In the second that helps you look for other pages on your site that you can link out too, because let’s say you have a thousand post on your site. Maybe it’s gonna be kinda hard to look them all up so you wanna go to your plugin section in your WordPress dashboard you’re gonna search for better internal links. 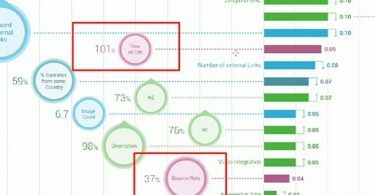 The time on your site, the amount of time that people spend your site is Google ranking factor and because of people spending a lot of time in your site Google is gonna look at that is why this site has a lot of valuable material so I’m gonna show you here the search metrics study now this is the top 35 results. and what this does it’s gonna find articles that have the keywords you want in the title of it, so you’ll see here up in the top left. I’ve already installed it so you can see it in your plugin list after Install it’s not gonna have, like a settings menu or anything like the other plugins but it’s gonna just include itself in your blog. This Regenera Activa website also using these plugins for increase page load time. So when you click on add a new post and you’re writing something, for example, I’m gonna use the same SEO example I did before and you wanna link to another page in your site that has to do with SEO. The normally what you do is you just highlight the word and then you go to the insert edit link. because WordPress is a search function. If you look for a word it’s gonna bring up every single article that has that word even in the body of the article and a lot of those articles are not gonna be relevant to what you want. 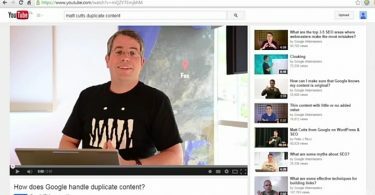 You just want the articles that tend to have that word in the title right because you’re trying to create links to certain pages on your site, that are most important for the Keyword. By using this method many advertising agencies build their internal structure. you can also use this method to increase traffic time on the website and also it helps to decrease bounce rate.